Middle and High School National Tour- Coming Soon. 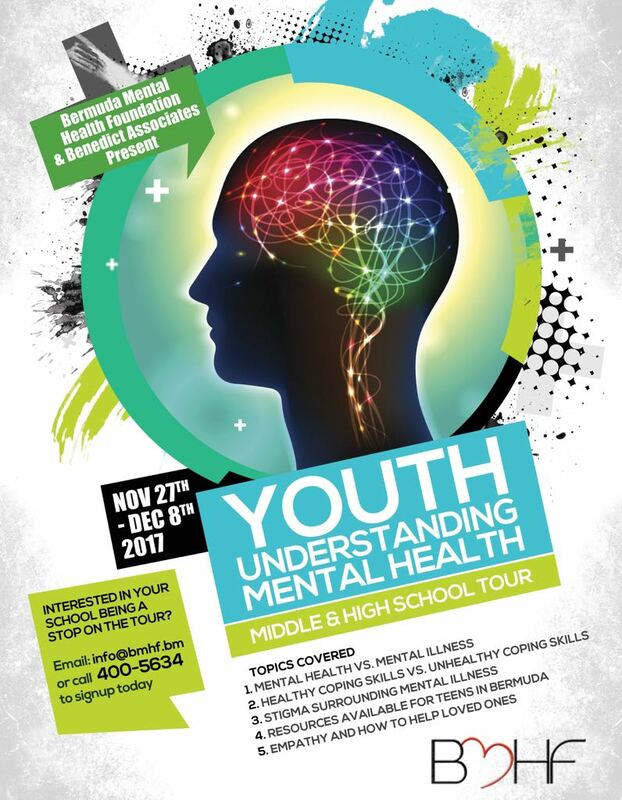 Hamilton, Bermuda (November 1, 2017) – The Bermuda Mental Health Foundation is pleased to announce the launch of its national middle and high school tour as a part of our youth understanding Mental Health Campaign. This campaign is a two-week educational and awareness campaign that is geared towards combating the stigma surrounding mental illness and educating the students about mental health, community resources and more. “Mental health is an important topic affecting the daily lives of many, BMHF is committed to help to educational initiatives for the public, dispelling myths and instilling a positive approach when dealing with such an important cause” says a spokesperson for the Foundation. The Foundation has several important events this year that with an objective to make the public more aware of mental illness and health in Bermuda. It is working in partnership with the Mid-Atlantic Wellness Institute, Human Rights Commission, Mental Health Court Pilot Programme and several community members to advocate on behalf of the mentally ill in our community. All public and private schools are invited to request to be a part of the tour by e-mailing info@bmhf.com or calling 400-5634. Presentations are arranged to accommodate middle and high school levels and are conducted by mental health industry professionals. For all the Foundation’s latest projects, initiatives, volunteer opportunities or to make a donation, visit www.bmfh.bm or e-mail info@bmhf.bm. We are inviting all media outlets to join the Foundation at some of the schools and would love the opportunity to provide additional information with a goal of receiving the maximum amount of coverage for this great cause. For public relations or any other media inquiries please call Jodi Lewis at (441) 400-5634. The Bermuda Mental Health Foundation is a registered charity and has two residential group homes and is currently raising funds to open a third. It is the Island’s singular organization that advocates on behalf of those suffering from mental illnesses and actively attempts to enhance the care of the mentally ill in conjunction with the Mid-Atlantic Wellness Institute.